Small farm near Florence that produces wine and extra virgin olive oil. The farm is located in Montespertoli, a town of about 10,000 habitants, 25 km from Florence, with shops and services of all kinds. 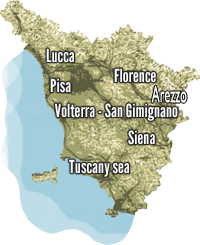 The house is located in a central position in the most important Tuscan cities, because in less than an hour’s drive away important art cities such as Pisa, Siena, Lucca, San Gimignano, Volterra. The Chianti area is located in the farmhouse is full of events, the most important include the Exhibition of the Chianti wine, which takes place from the last Sunday in May for a week. All’inteno The farm was originally an ancient farmhouse of 1700, the hospitality is offered in two independent apartments separated by a small country road. The pool (7.25 x4, 60) is common. From the farmhouse you can enjoy a beautiful view over the surrounding hills. MP1063-1 Bilo (2 people+2) ground floor, 100 mq, large kitchen , double bedrooom, bathroom with shower, large living room. Washing machine, oven, cooking platform, fridge with freezer, american coffee machine, TV SAT. MP1063-2 Bilo (2 people +2) 70mq Large kitchen, double bedrooom, bathroom with shower, large living room. Washing machine, oven, cooking platform, fridge with freezer, american coffee machine, TV SAT. Total price includes: kitchen linen: kitchen towels, tablecloths, towels (towel, a small person), bedding (pillow, sheets, pillows, blankets), cooking gas, electricity, water, swimming pool (7 , 25×4, 60) H min 1.5 m (open from mid May to mid September).